Kant is the central figure of modern philosophy. He sought to rebuild philosophy from the ground up, and he succeeded in permanently changing its problems and methods. This revised edition of the Prolegomena, which is the best introduction to the theoretical side of his philosophy, presents his thought clearly by paying careful attention to his original language. Also included are selections from the Critique of Pure Reason, which fill out and explicate some of Kant's central arguments (including famous sections of the Schematism and Analogies), and in which Kant himself explains his special terminology. The first reviews of the Critique, to which Kant responded in the Prolegomena, are included in this revised edition. The volume is completed by a historical and philosophical introduction, explanatory notes, a chronology, and a guide to further reading. 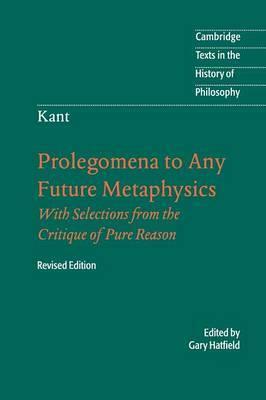 Prolegomena to Any Future Metaphysics; Selections from the Critique of Pure Reason: From the Transcendental Aesthetic; From the Transcendental Logic, Introduction; From the Transcendental Logic, First Division, Analytic; From the Analytic of Principles; From the Transcendental Logic, Second Division, Dialectic; From the Transcendental Doctrine of Method; Background source materials: The Goettingen (or Garve-Feder) Review; The Gotha Review. Gary Hatfield's publications include The Natural and the Normative (1990) and Descartes and the Meditations (2003).